Window is resizeable, enabling more contacts to be viewed at once. c) Opening a 'labels' file. If you want multiple entries you can 'Repeat' the currently visible entry any number of times. 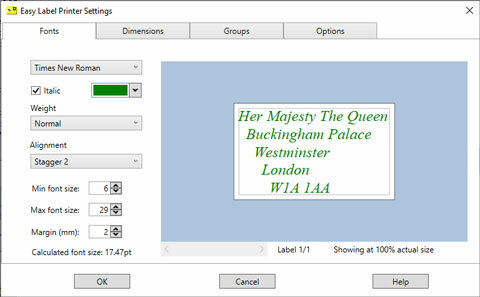 Each label in the list is fully editable. 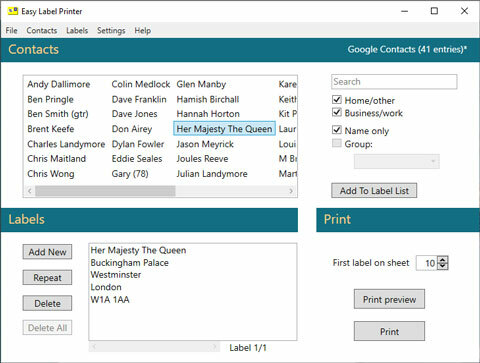 Then you simply print the label list, starting from whichever label on the sheet you like. Each address is formatted for you; the size of the font is adjusted according to the number of lines in the address and is perfectly positioned. Sheets of labels are widely available from stationery shops. 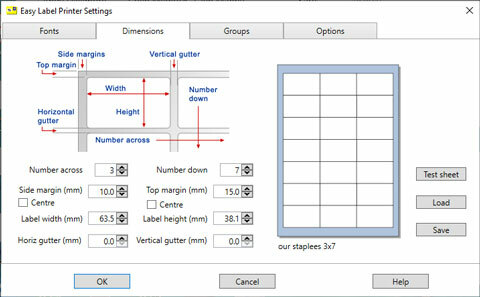 Typical useful layouts are 2x7 or 3x8 (a long list of Avery templates is included). For most people printing onto label sheets is far more convenient than trying to print directly onto envelopes.